I am joined on this track by my friends Kathleen Lawrie from Birmingham, England, and Kevin McElroy from Freeport, Maine. Kevin played banjo and Kathleen played piano. I first heard this tune played by musicians from Ballinakill, County Galway on an old 78 RPM recording. 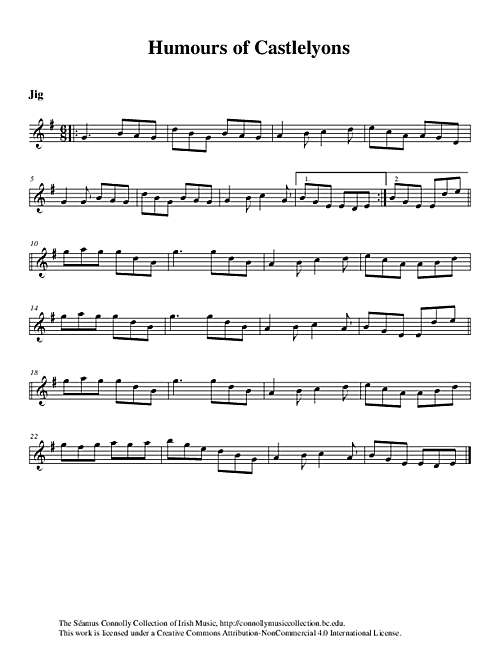 McElroy, Kevin (banjo), Connolly, Séamus (fiddle), and Lawrie, Kathleen (piano), “Humours of Castlelyons,” The Séamus Connolly Collection of Irish Music, accessed April 20, 2019, https://connollymusiccollection.bc.edu/document/458.